The barbarism and lack of compassion shown by British officers in Roland Emmerich's brutal and bloody war epic, The Patriot, are almost enough to make you feel ashamed of belonging to this island. Innocent men, women and children are slaughtered in the name of king and country not to mention the spilt blood of defenceless prisoners of war. 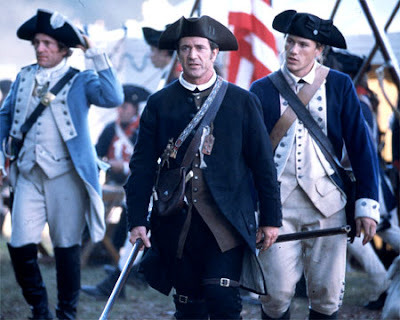 It's no wonder that 18th century war hero Benjamin Martin (Mel Gibson) feels the compulsion to take a tomahawk and musket to the might of the British Empire. It takes some time to get him warmed up, however. At the beginning of the film he is living at peace with his seven children in a sprawling South Carolina plantation after distinguishing himself in the French and Indian Wars. The horrors of conflict come back to haunt him when his headstrong eldest son Gabriel (Heath Ledger) defies his orders to join the American army. Unwilling to get involved himself, Benjamin finally joins the fight when second eldest son Thomas (Gregory Smith) is killed in cold blood by sadistic British officer, Colonel Tavington (Jason Isaacs). Determined to protect the rest of his family and sister-in-law Charlotte (Joely Richardson) from harm, Benjamin takes up arms alongside his patriotic son Gabriel, leading a brave militia into battle against the overwhelming English army. Gibson is marvellous in the lead - terrifying on the battlefields as he carves up the enemy with a maniacal glint in his eye and heart-breaking as the bereaved father, devastated as the war claims the lives of the people he loves most dearly. The contradictions in Benjamin's personality - torn between his pacifist principles and protecting his brood - provide Gibson with several emotionally charged scenes, including a couple of opportunities to break down and cry his heart out. The film's screenplay by Robert Rodat concentrates on the star, often at the expense of supporting players. Gabriel is underdeveloped, operating at times as a plot device to coax his father back into battle. Rising star Ledger makes the most of his second billing though, and demonstrates a magnetic screen presence. Richardson is shamefully under used while the British commanders are all stiff upper-lipped caricatures, two-dimensional villains the lot of them.